In the course of the end customers’ PCB manufacturing process, the pad is loaded into a standard SMT chip shooter and then picked-and-placed alongside other components and the PCB is solder reflowed. Each PCB thereby gains a unique identification. This provides traceability data not only for the PCB, but also for all other components contained on the populated PCB and for the final assembled device. It is paramount that the high density miniature Data Matrix code is present and readable on each individual pad. Therefore, the manufacturer looked for a reliable solution to ensure code readability during the manufacturing process of the pad reels. For such a demanding application, they opted for the QX Hawk flexible industrial imager from Microscan, which is the first imager in the world to be fully integrated with liquid lens technology, enabling infinite focus flexibility. 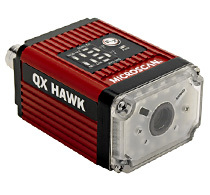 Bridging the gap between ease of use and performance, the QX Hawk features a high resolution modular optical zoom system, aggressive X-Mode decoding, and simple plug and play connectivity. The QX Hawk imager easily reads any barcode or 2D symbol, including challenging 2D direct part marks (DPM), in any environment, within seconds of installation. The QX Hawk ensures readability by decoding the Data Matrix code on the pads, and double checks that the code is present and that the data it contains is logged correctly. The solution was developed with the QX Hawk that reads four codes within the image field of view, arranges the read data into a specific sequential format with separators and sends the codes in the correct sequence to a database. This was achieved using Microscan’s ESP (Easy Setup Program) software and the integrated Ethernet networking which enables high speed communication between the QX Hawk and the server. Thanks to the solution, the end user can be sure that the codes on the pads are logged correctly and that they are readable. In addition to selecting the most cost-effective automated solution to the challenge of WIP product traceability in the electronics manufacturing industry, the end users can count on full traceability of the PCBs during and after the production process, avoid downtime and failures, increase efficiency, and reduce costs. The manufacturer of the pads has also improved efficiency in their own production process. Instead of reading just one pad at a time, by moving a barcode reader across the production line, the QX Hawk imager can handle reading four pads simultaneously from a stationary position. This significantly speeds up the production time, as well as avoids downtime as there are no moving parts in the decoding solution. For assistance finding the right Microscan product for your automated application, contact us at BarcodesInc.